Part Number: MF267. 6 Hard Drive Caddy Screws. 2 Hard Drive Caddies. Compatible with Dell Latitude D630 P/N XP994 0XP994. Fix the 2.5" hard drive to the caddy with the screws and then install it into your laptop. Fits 2.5" Laptop Hard drive. Compatible with Dell Latitude D630 P/N XP994 0XP994. Fix the 2.5" hard drive to the caddy with the screws and then install it into your laptop. 10 x screws. Fits 2.5" Laptop Hard drive. Latitude: D400 D410 D500 D505 D510 D600 D610 D620 D800 D810 D820 D830 X300 X1. Caddy fits 2.5" Hard Drives. Also Includes Screws to Close the Caddy. This genuine DELL Internal Secondary Hard Drive Module allows you add a secondary IDE/PATA 2.5" hard drive to your laptop. Model: for Latitude D620 D630. Compatible models: Dell Latitude D620. The hard drive caddy locks into your system for safety and security. 1 X Hard Drive Cover. Quantity: 1 Set. Due to the difference between different monitors, the picture may not reflect the actual color of the item. Lot of 10 CN-0MF267 HDD Hard Drive Caddy Dell Latitude D620 D630 XP994 MF267 --- Payment: · We accept DEBIT, CREDIT, & PAYPAL ---Shipping: · Free shipping · We ship it out 1-2 days after your payment have been completed ---Return Policy: · Please contact us for return items · 30 days warranty · Exchange on certain items ---A15K03 Store: · If you have any problems, don’t hesitate to contact us. We will reply to you within 24 hours. · We maintain a high standard of excellence & strive for 100% customer satisfaction. PLEASE contact us before giving your feedback! This way we can satisfy your concern~! · T H A N K Y O U !. It’s Necessary For The End User To Check With The Manufacturer, Manual Or Other Web Sources To Insure Compatibility. Used Grade C This Grading Show That The Item Is In Fair Condition For its Age And Will Show Heavy Signs Of Wear. Latitude: D400 D410 D500 D505 D510 D600 D610 D620 D630 D631 D800 D810 D820 D830 X300 X1. This genuine DELL Internal Secondary Hard Drive Module allows you add a secondary IDE/PATA 2.5" hard drive to your laptop or desktop. For Dell Latitude D630. We might require you to send us photo/s of the item received and also your original item so we can compare and conduct necessary actions. 10 x mounting screws. Plug and play, easy to use. ONE DELL Latitude HDD Hard Disk Drive Caddy Cover Door Laptop P/N XP994 w/ 2 Screws included each. Dell Latitude. 2 Screws included each. P/N XP994 0XP994. Sorry, this item cannot be sent overseas. Dell Latitude D630 D630c D631 HDD Caddy XP994, DN194. Dell P/N: XP994. Latitude D630 / D630 ATG, D630c, D631, M2300. Dell Latitude Drive Caddy 1 screw. Dell P/N: DN194. -Hard drive, is not included. P/N XP994 0XP994. 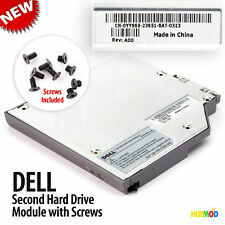 DELL Latitude HDD Hard Disk Drive Caddy Cover Door Laptop P/N XP994 w/ 2 Screws included each. Dell Latitude. Compatible with. SATA 60.0GB Hard Drive is installed in Caddy. Compatible with Dell P/N MF267. New Dell Latitude D620 SATA Hard Drive Caddy Cover with Screws MF267. for Dell Latitude D630. We might require you to send us photo/s of the item received and also your original item so we can compare and conduct necessary actions. Compatible with Dell Latitude D630 P/N XP994 0XP994. Fix the 2.5" hard drive to the caddy with the screws and then install it into your laptop. Fits 2.5" Laptop Hard drive. Give us a chance to make things right for you, and we will do our best to provide a fitting solution. Manufacturer Part Number: MF267. Hard Drive Caddy Details. Part taken from a good, working Dell Laptop. Dell OEM Original Part. These pictures show what will be included with the part portrayed. Need Help Deciding Which Part to Buy?. Latitude: D400 D410 D500 D505 D510 D600 D610 D620 D800 D810 D820 D830 X300 X1. This genuine DELL Internal Secondary Hard Drive Module with 80GB HDD allows you add a secondary IDE/PATA 2.5" hard drive to your laptop. Dell P/N: 0XP994, XP994. Dell Latitude Series. 1 pcs Harddrive Caddy Screw. Dell P/N: 0XP994, XP994. Dell Latitude Series. 1 pcs Harddrive Caddy Screw. 1 pcs Harddrive Plastic Cover. Will Fit 2.5" SATA Laptop Harddrive, Any Capacity. Dell P/N: 0XP994, XP994. Dell Latitude Series. 1 pcs Harddrive Caddy Screw. 1 pcs Harddrive Plastic Cover. Dell P/N: 0XP994, XP994. Dell Latitude Series. 1 pcs Harddrive Caddy Screw. Included in this Kit. Manufacturer Part Number: XP994. Hard Drive Caddy Details. Part taken from a good, working Dell Laptop. Dell OEM Original Part. These pictures show what will be included with the part portrayed. Product Details. Tested and working. What you see is what you get. If we have made an error, we do apologize, we are only human, let us know so we can fix it for you. Part number - MF267 0MF267. for Dell Latitude D620 D630. 5 x Hard drive Cover. Plug and play, easy to use. Modular construction, you can just remove the CD driver and put this in the slot. This is for One Lot of 40 Dell Latitude D630 hard drive caddies. - Caddies ONLY, NO Screws or other parts etc, just the plastic caddy. I also have a few D620 Caddies that I will throw in for free. Compatible With: Dell Latitude D620 D630 MF267 0MF267 XP994. (E.g. you brought wrong size or wrong item). Dell XP994 Latitude D630 D630C HDD Hard Drive Cover Plate Caddy With The 3 Dell Screws. Dell Latitude 14.1" D620 D630 Genuine Laptop hard Drive Caddy Bay XP994 "A"
This way we can satisfy your concern~! We will reply to you within 24 hours. Compatible with: for Dell Latitude D620 D630. - Model: D620 D630. - Product Type: HDD Hard Drive Caddy Cover. 25Piece HDD Caddy Cover Bezel. 25Piece Screws. Dell Latitude D620 D630 HDD Hard Drive Caddy Cover with Screw. - Compatible with: Dell Latitude D620 D630. 1x HDD Caddy Cover Bezel. Part number: MF267 0MF267 CN-0MF267. Fits model(s): Latitude D620 D630. 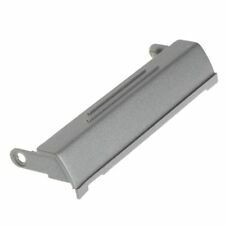 Repair or upgrade your laptop with this genuine OEM hard drive caddy/tray/cover. DELL Latitude: D500, D505, D510, D520, D530, D600, D610, D620, D630, D800, D810, D820, D830, D8100, D5100, X1, X300, D400, D410, D420, D430. 1 X 2nd HDD Caddy. The Dell 2nd Hard Disk Drive Adapter for UltraBay Slim gives you maximum storage flexibility enabling you to add a second Dell notebook hard disk drive to any UltraBay Slim modular bay. SATA to IDE 2nd HDD HARD DISK Drive Caddy for DELL Latitude D500 D505 D510 D520 D530 D600 D610 D620 D630. DELL Latitude: D500, D505, D510, D520, D530, D600, D610, D620, D630, D800, D810, D820, D830, D8100, D5100, X1, X300, D400, D410, D420, D430. Compatible with: for Dell Latitude D620 D630. - Model: D620 D630. - Product Type: HDD Hard Drive Caddy Cover. 25Piece HDD Caddy Cover Bezel. Due to the difference between different monitors, the picture may not reflect the actual color of the item. Dell Latitude D630 Laptop. 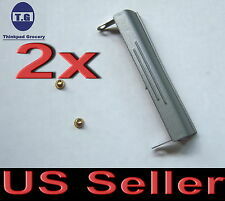 1pcs Dell Latitude Hard Drive Caddy Cover & 3pcs HD Screws. 1pcs Hard Drive Caddy Cover. 3pcs Hard Drive Screws. Dell Latitude D630 Laptop. 10pcs Dell Latitude Hard Drive Caddy Cover & 30pcs HD Screws. 10pcs Hard Drive Caddy Cover. 30pcs Hard Drive Screws. Dell D620 D630 D631 D800 New. Add this caddy to your laptop to give you another hard drive. This 2nd SATA Hard Drive Adapter lets you add a second hard drive to the laptop systems. 1x Hard Drive Adapter/caddy (P-AL127MM). WHAT YOU SEE IN PICTURES IS WHAT YOU GET, unless otherwise stated. If this item is used normal wear & tear is to be expected.